Ukrainian importer paired with a Chinese manufacturer of long harnessed with the title that Geely GX7, then Emgrand X7. In the second version, by the way, and stopped. But with the price determined rather quickly – 138 900 hryvnia for the base version with a two-liter gasoline engine (139 hp) and the “mechanics”. And here is the version with the 2.4-liter engine (158 hp) and the “automatic” will cost 155 900 hryvnia. In a press release, the model is called a flattering elegant and distinctive. However, like it or not, in the guise of Geely Emgrand X7 unmistakably recognizable identity of past generations, “Toyota» RAV-4. Maybe it’s for the better? Accepting applications for the Ukrainian market for the first crossover from Geely opened today, and bring Emgrand X7 going even before the promised date – during July. Car design is developed by Giorgetto Giugiaro and its dimensions are consistent with a crossover “average degree of compactness.” With a length of 4541 mm and a width of 1833 mm “Gilly” is only slightly inferior to the Honda CR-V (4570 and 1820 mm) and the Toyota RAV-4 (4570 and 1844 mm). 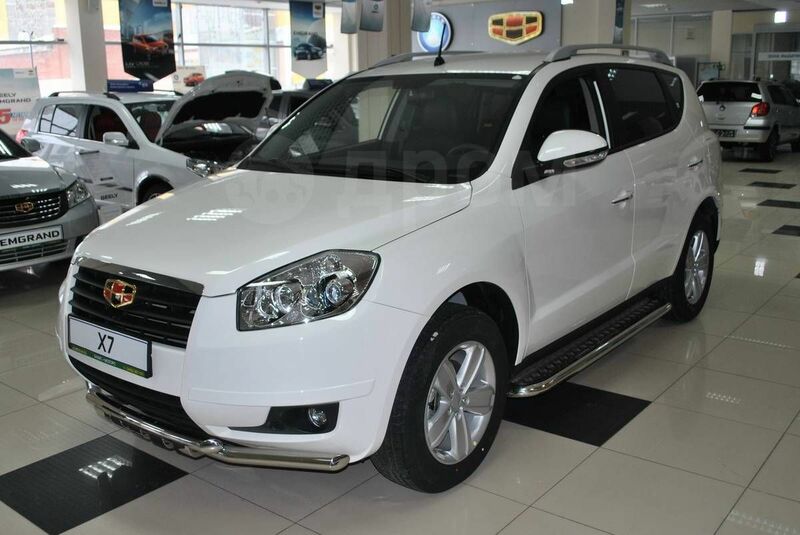 Clearance Geely Emgrand X7 is about 170 mm. Drive – front only. For Ukraine, prepared two configuration (Basic and Comfort) and two petrol engine capacity of 139 hp and 158 And if the first will be offered only with a five-speed “mechanics”, the second – only with the “automatic”, able to juggle six gears. Only here to enjoy a six-speed automatic transmission, the owner will have as standard. In order not to exceed the reasonable price limits, a top performance Comfort made available only to “manual» Emgrand X7. Alas, the leather upholstery is paired with the “automatic” Ukrainians still be seen. In the “base” includes ABS + EBD, dual airbags, trip computer, audio system with 6 speakers, air conditioning, heated front seats, front and rear electric windows, alloy wheels, alarm, central locking with remote control, and anti-corrosion treatment, which adds to the price any version of the model 850 hryvnia. Execution Comfort additionally put powered driver’s seat, leather interior of a combined, climate control, front and rear parking. And the 139 – and 158-horsepower engines were of good appetite. According to the passport data, the combined cycle Emgrand X7 consumes 8.6 and 9.5 liters respectively. It is noteworthy that Geely Emgrand X7 still joins the small number cohort SUVs worth up to 20 thousand dollars . The initial version with an engine capacity of two liters and the “mechanics” will cost 138,900 USD. The cost of a complete set of “Comfort” with the same powertrains will be 144,900 USD. A smaller inside, but automated and more powerful “Emgrand” will demand 155,900 USD. Ludacris : Cadillac Escalade EXT : Stars..